Starting this week, I’m going to be posting a new travel photo every week from some of our adventures around the world. Locations will include Canada, the United States, England, France, Italy and New Zealand plus hopefully many more in the future. This week’s photo is one of my favourites from our trip to Lake Como, Italy in 2006. We were lucky enough to be flown out there for Doug and Jasmeena’s wedding and stayed a few days afterward for a mini-vacation. 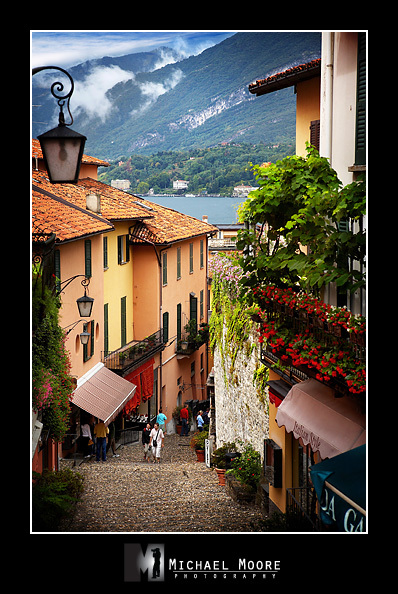 The photo below is a view down Salita Serbelloni in the gorgeous little town of Bellagio – considered by some to be one of the most beautiful towns in Europe. It’s filled with quaint shops and cafés, cobblestone streets and colourful architecture in every shade of red, orange and yellow. All this set along the shores of stunning Lago Di Como and surrounded by the Prealp mountains. Prints of this and other travel photos can be purchased at my online Fine Art Gallery. We have this image hanging in our home as a 20×30 canvas wrap and it looks absolutely stunning!